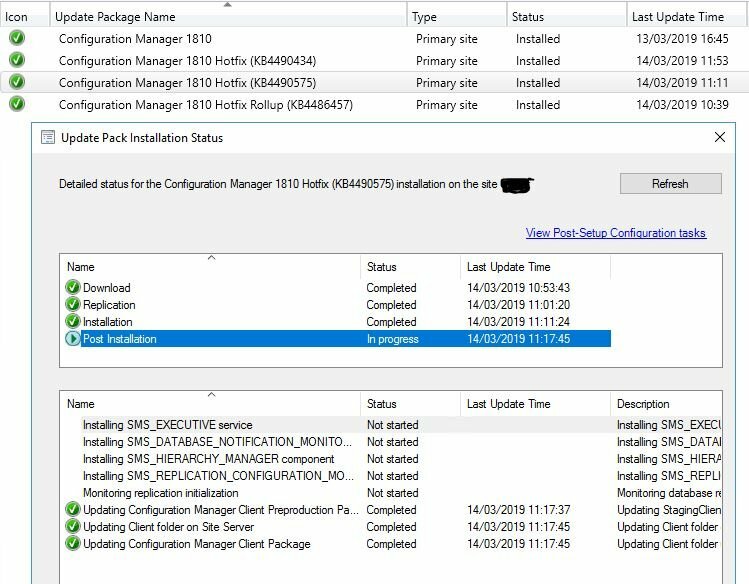 I updated our SCCM deployment to 1810 last week, including installing Hotfix Rollup KB4486457 and Hotfixes KB4490575 and KB4490434. Now we seem to have duplicate user resource objects. The main difference between the two objects is the newly-created object only has the "SMS_AD_USER_DISCOVERY_AGENT" listed in "Agent Name" in the properties of the resource whereas the original object additionally has "Intune_User_Discovery_Agent" listed. Other differences include the "Agent Time (UTC)" property: the new object has a recent timestamp (today) but the original has two timestamps (one from before the upgrade and the other from last year); the "Creation Date (UTC)" property and "Resource ID" are obviously different also. I don't think we've hit this: https://support.microsoft.com/en-gb/help/4490434/duplicate-user-discovery-columns-in-configuration-manager. The SQL query yields no results. One thing that is strange is if I look at the "Updates and Servicing Status" for the last two hotfixes, they both show "Post Installation" as "In progress" despite both having an overall status of "Installed" (see attachment for example). Does anyone know what might have happened and how to fix? Which object should we get rid of and what's the best way to do this in bulk?